A little boy of two with cancer stunned his family after waking up from a coma moments after his parents agreed to turn off his life support. Dylan Askin, from Shelton Lock, Derby, was sent home after his miracle recovery and now, two years later, has beaten his one-in-ten-million illness. He had contracted an extremely rare type of lung cancer and was so ill his family had him christened as he lay in his hospital bed on Easter Sunday, 2016. 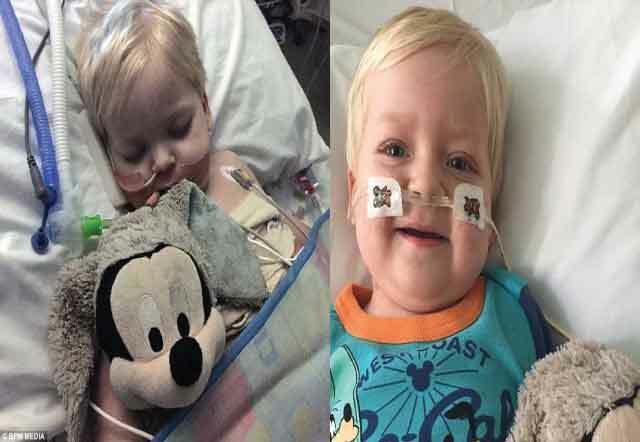 Doctors did not think he would survive and Dylan’s parents made the heartbreaking decision to have his life support machine turned off. But the plucky youngster defied expectation, suddenly stirring at the Queens Medical Hospital. He was awake – and soon began to regain his strength. The tiny tot was deemed stable enough to return home by Easter Sunday. Two years on Dylan has beaten his illness. Kerry Askin, Dylan’s Mum, said: ‘I was strong in the belief that Dylan was our Easter miracle. ‘I am not massively religious, but I did think it was a miracle.